Patty Mills Headed To NYC? Patty Mills has never been a household name but after his NBA Finals performance against the Heat, he's headed in the right direction. 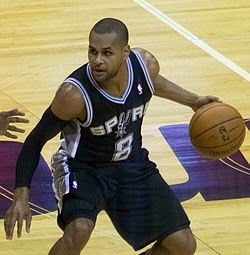 Mills averaged 15.2 minutes for the Spurs off the bench and scored 10.2 points a game. He really helped San Antonio close out the series with his performances in game 4 and 5. Mills was 9-14 from behind the arch and scored 31 points in those final two games. With that being said, Mills has caught the attention of the New York Knicks who are desperately looking for an identity at the point guard position. Raymond Felton has outstayed his welcome and is likely on his way out of New York, and Pablo Prigioni is 37 years old. We all know there is a strong possibility that Carmelo Anthony opts out of his contract, which will allow him to become a free agent, and this will allow the Knicks to rebuild. Mills is only 25 and could be a building block for the Knicks future. After the 2014-2015 season, Amar'e Stoudemire, Tyson Chandler and Andrea Bargnani will all become free agents ($73 million off the books) which will allow the Knicks to sign big time free agents - Kevin Love, LaMarcus Aldridge, Al Jefferson, Brook Lopez, Chandler Parsons, Marc Gasol, DeAndre Jordan, Rajon Rondo, etc. There is a reason why Phil Jackson was brought into the Knicks front office and that was to fix this team. Expect the Zen Master to have a master plan and turn this franchise around!